The biggest prisoner protest in U.S. history took place from December 9-16, 2010, in the Georgia state prison system. It is likely most 4sm readers have heard, at least some news from CNN, the NY Times and other sources on this strike of Georgia’s state prisoners. Here is a round up of some of the specific information and a few thoughts on the significance of this struggle for all prisoners. Thousands upon thousands of prisoners stayed in their cells on Dec. 9, and refused to come out and work. They launched a traditional, powerful, peaceful and legitimate labor action—a workers’ strike. This strike was the united action of Black, white, Latino, Asian, Muslim, Rastafarian, Native, Christian, and other groups of prisoners. The corporate news media largely ignored this strike, but there was some reporting of prisoners using contraband cell phones to communicate and coordinate the protest between the different prisons. Also, there were reports that prisoner spokesmen were contacting and informing the media about this strike. They were also reported to be calling community and revolutionary activist organizations and leaders about what was going on behind the walls. Alternative media, such as Amy Goodman and Democracy Now, Hard Knock Radio and the Black Agenda Report were providing extensive coverage day by day. 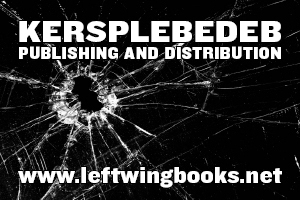 The Left press, papers, zines and online provided extensive coverage of the strike and its aftermath. Solidarity demonstrations have taken place in many cities including Detroit, Oakland CA, Richmond VA, Denver, Raleigh NC, and New York City. 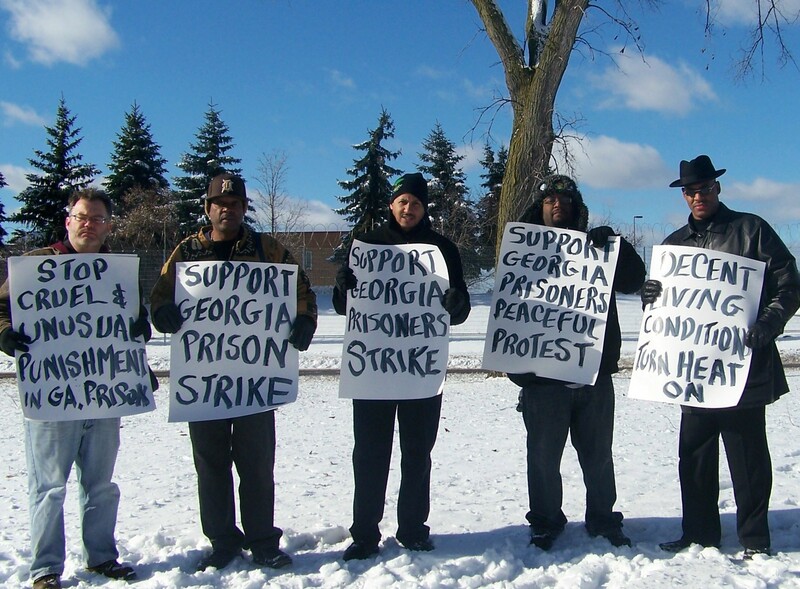 On December 17, representatives of the “Concerned Coalition to Protect Prisoners Rights,” met with the Georgia Department of Corrections to press for action on the strikers demands. The Coalition is made up of the NAACP, the Nation of Islam, and other community organizations. The Coalition reported no positive results from the meeting but pledged to continue their support for the striker’s demands. Since December, reports have surfaced about harsh repression, beatings, destruction of property and middle of the night transfers of suspected leaders taking place in all the state prisons in Georgia. No doubt all this is happening, for this is the usual response that prison bosses take when prisoners unite, stand up and call for justice and human rights. There are almost 2 1/2 million men, women and children in prisons across the United States. Basic conditions necessary for health and survival are poor if not totally lacking: inadequate medical care; overcrowding; poor food; no pay or pennies an hour for prisons jobs, including working for private corporations behind prison walls; guard brutality; little educational or job training; huge sentences; limited visiting, prisons hundred or thousands of miles away from the prisoners home areas, etc., etc., etc. This is the continuing reality of prisoners in the U.S. This harsh situation will get worse, as prison budgets are cut, while the number of men, women and children being locked up continues to rise or at least remains as high as ever. More prisoners struggle, including well organized united efforts will increase. Of course divisions based on race, geographical location, street organizations, religions, age, etc., also continue to exist and these are used by prison officials to keep convicts divided and more easily controlled. So we will not doubt also see acts of frustration and prisoner on prisoner violence. It is up to all convicts, all solid prisoners, to act in their common self interest, to act for the good of all and our families, to unite and stand up for justice and human rights. Lets also keep in mind, that the more informed, conscious and united we are before any crisis, will determine how strong we are during the struggle and what the outcome will be—if we will be successful to any degree. As we all know, and as our history informs us, prison struggle is real struggle—it is no joke. There is always a price to pay, for even small reforms. Prisoners get killed, get brutalized, get more time, get sent to control units, but that is the price some of us might have to pay to advance the rights and life conditions for all who follow. One important and positive development of the Georgia prisoners strike was the support and solidarity they received from outside groups and people. This was also an important feature of the massive prison struggles of the 1970s and early 80s. Outside awareness and support is very important and should be developed by prisoners. Likewise, outside groups should make and maintain contacts with people inside. As solid as outside support can and should be, the initiative and actions must come from inside, from prisoners, united and strong. There is more to reflect on all this, on the Georgia prisoners strike and prison struggle in general. 4sm will print more information and discussion on all this, so send us your thoughts. There is also an online petition in solidarity with the prisoners’ demands at: petitiononline.com/wagesnow/petition.html. Visit iacenter.org for more information and to sign the petition. See, also, this March 1st update.